I love this recipe for the amazing fall flavors and how easy it is to make. 1Pre-heat the oven to 425 degrees. 2Place the cubed and chopped vegetables into large roasting pan. Add basil leaves, salt and pepper. 3Place the sausages on top of the vegetables and puncture them several times with a fork. 4Cover and roast for 30-40 minutes or until done. 5Add wine to deglaze and hold in a warm oven. 6Bring 2 cups of water to a boil; add polenta a little at a time, whisking constantly. Once completely whisked in, add butter, then lower heat and continue stirring until the mixture has thickened, about 10 minutes. Add a few slices of your favorite cheese for creamier polenta. Herbed goat cheese is a nice addition. 7Serve the polenta topped with the sausage and vegetable mixture. 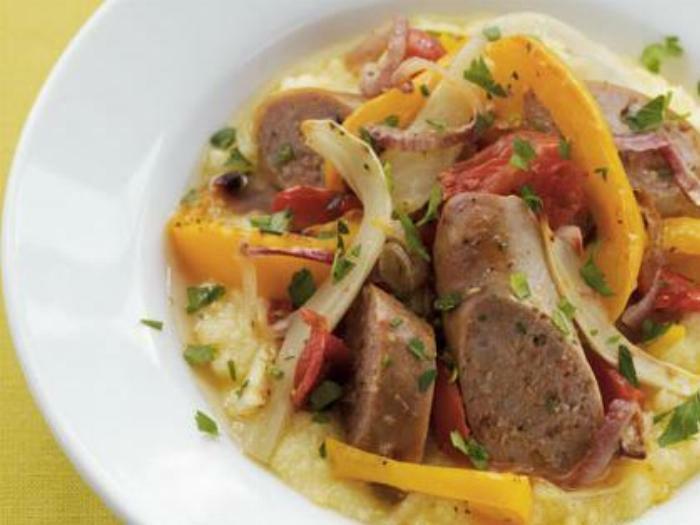 Make sure to pour juices over the sausage, vegetables and polenta.